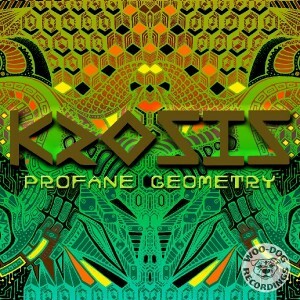 Woo-Dog Recordings is happy to bring you Profane Geometry, the hard-hitting digital debut of Krosis, a psytrance producer from Bristol, U.K., who has already built a solid local following. This release is designed to showcase the variety of soundscapes he’s intent on bringing to the scene. Popping from night-time growlers to chunky full-on groovers, his driving bass lines and organic atmospheres create a shimmering fractal journey for the listener. All tracks written and produced by Rob Incledon-Webber; design and artwork by Anna Foundinaforest; mastering by Morris at Cymatic Studios; released in 2014 by Woo-Dog Recordings. MP3 Download | FLAC Download | WAV Download · Download count: 6,959. Hey guys! I know the vocal sample from the first track is from Eyes Wide Shut, my question is in which other track is this used?! Yes, whenever I see Woo Dog Recordings, I know it’s going to be good shite!! Good on ya, great album!! Really great production/mastering, song ideas are pretty cool, more darkpsy than anything. Banging! So glad you’re getting your music out there Krosis… Would love to hear you play live! Electrifying tunes ! Awesome stuff by Krosis ! I’m always coming back to this one. Deep and dark.